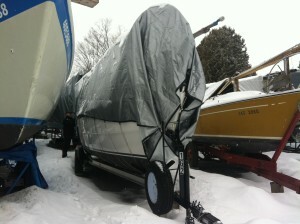 With less than two months until spring, it’s time to start preparing for the upcoming boating season….never too early. We paid a brief visit to R.E.D. to make sure there wasn’t too much snow accumulating on her tarp. All was good. 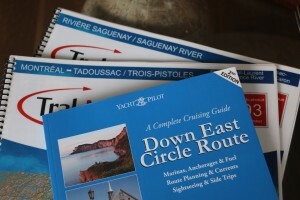 Then we stopped to pick up our Atlas of Tidal Currents, a publication that will help us in navigating the challenging waters of the Saint-Lawrence River. 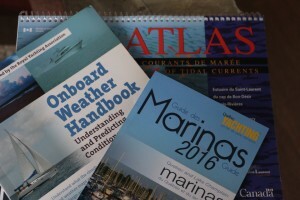 Also necessary and in Canada, mandatory to have onboard, paper charts for the areas we will visit. There is much to do between now and spring launch. We have an ever-growing to do list, including modifications to complete and purchases to make so our life on the water is as safe as possible. Some additions will also help to give us more autonomy while away from home. I’ll be keeping up to date on our progress with a blog post here and there so check back with us from time to time or to make it even easier, why not subscribe by email and little R.E.D. tidbits will be delivered directly to your inbox. Wave Lady has gotta keep in touch with her sister ship, R.E.D.!! Congrats on the new blog – I was wondering what you were up to! Hey there Wavy Lady! Great hearing from you! It has been a while but this is sort of our hybernation period. We’ll all be back on the water before we know it though. Keep in touch. Stay safe. Stay happy.